Ropa Vieja means “old clothes” in Spanish. 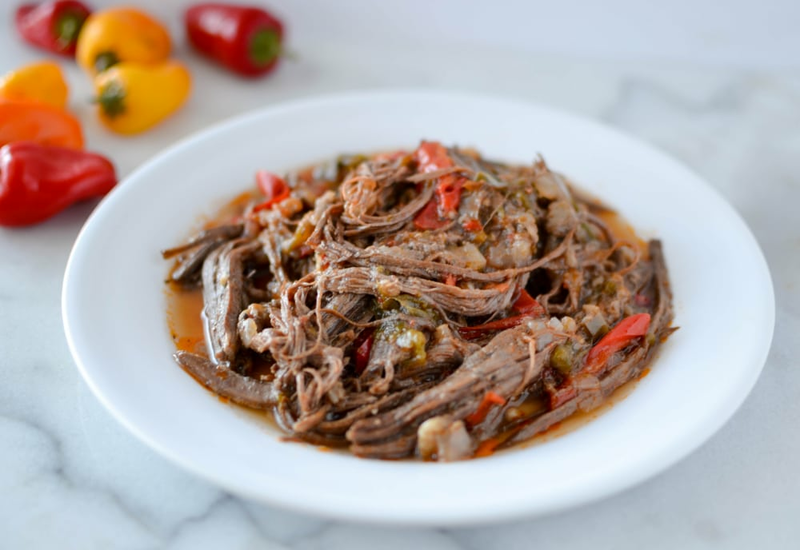 This pressure cooker version of the Cuban traditional beef stew is made with tender shredded flank steak in a tomato sauce with flavorful peppers and onions. This shredded or pulled beef resembles tattered cloth, thus the descriptive name. This Cuban comfort food dish is most commonly served with rice and beans. It is also popular in other parts of the Caribbean such as Puerto Rico and Panama. The origin of this classic caribbean dish is actually from the Canary Islands off the coast of North Africa. The original version of Ropa Vieja was a creative use for leftovers, but later became a shredded meat dish. In the Canary Islands it is often prepared with garbanzo beans. Per Serving: 445 calories; 22g fat; 10.0g carbohydrates; 43g protein; 119mg cholesterol; 435mg sodium. Had never heard of ropa vieja, but am completely glad I decided to try it! A big plate of this with spicy black beans and rice hit the spot perfectly. Very simple and savory recipe. I could see doing this in wraps/burritos, too. Even piled on garlic mashed potatoes. It's just so good. I was pleasantly surprised at how good this recipe was. I made some fried corn tortillas and served the ropa vieja on top, similar to a tostada. The dry red wine gives it a really special flavor, so if you make this recipe definitely don't skip that step! Very good, authentic tasting ropa vieja! Incredible flavor! I served mine with basic white rice. This recipe was very quick and easy to make in the pressure cooker. I made this recipe with rice and beans. Very good, traditional ropa vieja recipe! The flank steak wasn't dry, perfect texture and excellent flavors. The wine and tomato sauce are a perfect combination. I am a huge fan of cuban food and sandwiches so I paired this dish with a nice french bread loaf and made paninis for the family. I substituted the flank steak with skirt steak to add a more beefy flavor and they turned out amazing. What a wonderful recipe. The only thing I changed was using a roast instead of flank steak. I have eaten this dish in a Cuban restaurant and this recipe was right on. Delish! I did add a Goya chicken boullon packet and a table spoon of sugar for a bit of extra flavor. OMG. This is finger-licking Good!!! And really easy! !